Survivor … Angela Barker at the UN in New York, where she will take part in a special session on women's health. 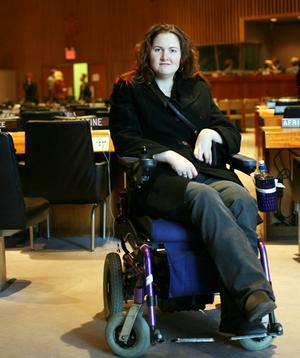 ALMOST six years after an assault by her ex-boyfriend left her severely brain injured, crippled and unable to speak, the Australian Angela Barker will participate in a special session of the United Nations General Assembly on children. Doctors warned her family that Ms Barker, who at the time of the attack was a 16-year-old schoolgirl, might never emerge from a vegetative state. Yet she has recovered to become an advocate for victims of domestic violence. "I hate myself for not realising how bad the situation was that I was in [but] I tell myself I was only young," Ms Barker, who has partially recovered her speech, said on Tuesday. She also communicates through a computer which makes written presentations audible. This week she is one of 15 young women from around the world meeting to examine issues of women's health and learning how to pursue policy change, at a four-day conference at the UN. The group will join in the special session over two days next week. Zonibel Woods, a policy adviser with the International Women's Health Coalition, said the group would be asked to research whether governments were fulfilling their commitments on women's health issues. It was hoped they would influence the declaration from the special session. Ms Barker, who is the sole domestic violence representative at the conference, said her main aim was to "listen and absorb information". "I am very proud of myself," she said of her recovery and new role informing schoolchildren, police and social workers of the horror she endured. "I tell my story and everything that has happened. I want women to take control of their lives and their relationships." Her story was made a key part of the Federal Government campaign against domestic violence launched in 2004. In March 2002 Ms Barker was punched, kicked and stomped by a youth after she had tried to end their relationship. She was comatose for three weeks and spent three years in a rehabilitation hospital and remains wheelchair bound. Between repeated violent episodes he said he would change, but each time the relationship resumed he attacked her again, said Ms Barker's mother, Helen Barker. And her home town of Benalla, in Victoria's north-east, was too small a town to be able to avoid someone indefinitely. Her attacker, 20 at the time of the assault, was jailed for 10½ years. Yesterday Angela and her parents, who are her full-time carers, met the Australian Ambassador to the UN, Robert Hill. Mr Hill said Ms Barker's ability to find new purpose in life was inspirational.